Packing a toddler’s plane bag.. This will be the third time we have taken Rosie abroad and I always pack her bag pretty much the same way. When it comes to Rosie’s bag, I live by the saying, ‘fail to plan, plan to fail’. I like having enough things with me to keep her occupied and busy throughout the flight. I always plan Rosie’s bag in 3 sections; things she needs, things to eat and things to do. 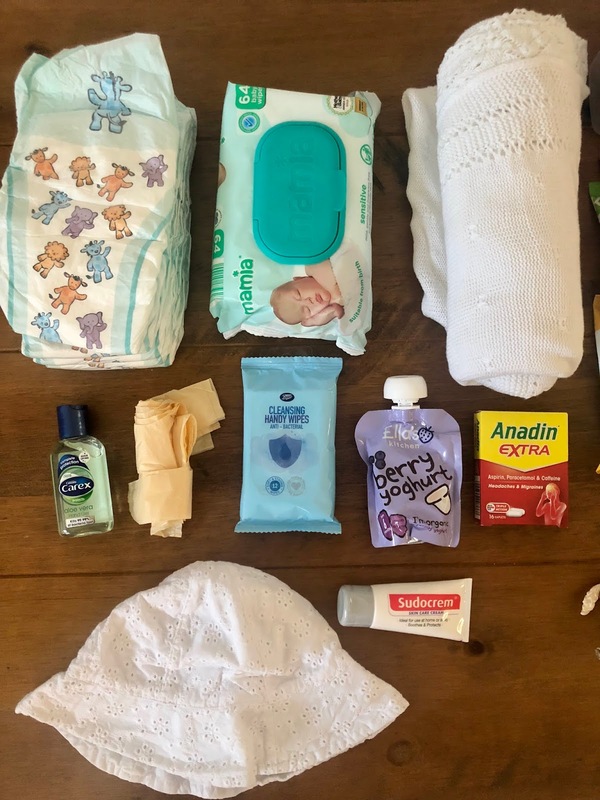 The obvious things are nappies and wipes, it’s only a 2 hour flight but I take 5 nappies so it’s pretty much a nappy per hour from leaving the house to landing. I know that it’s very unlikely I’ll need all of them but at least I’m covered if for some reason we are delayed or she has an accident. Her wipes go without saying because I can’t go anywhere without them now! I often wonder how I got by without carrying wet wipes before I became a Mum because I use them for everything. Nappy sacks for obvious reasons but also the less obvious things such as clearing the plane table before the air hostess comes around, putting wet clothes in if Rosie spills something etc. They always come in handy. The Anadin pictured are of course mine because I’ve always got a headache. I always pack a sunhat for when we land in Mallorca to avoid any first day mishaps. I have hand gel and mini anti bac wipes just to wipe down the plane table and chair arms just because I like knowing I’ve done it before Rosie starts touching everything. I’m not a clean freak it’s just certain things like that I’d rather know I’ve cleaned myself. I also have a blanket and a spare outfit because you just never know what spillages might happen or if it’s going to be cold on the plane. Snacks - if you follow me on Instagram you’ll know Rosie doesn’t stop eating, she snacks through the day as well as her three main meals, and is always looking for what she can eat next. 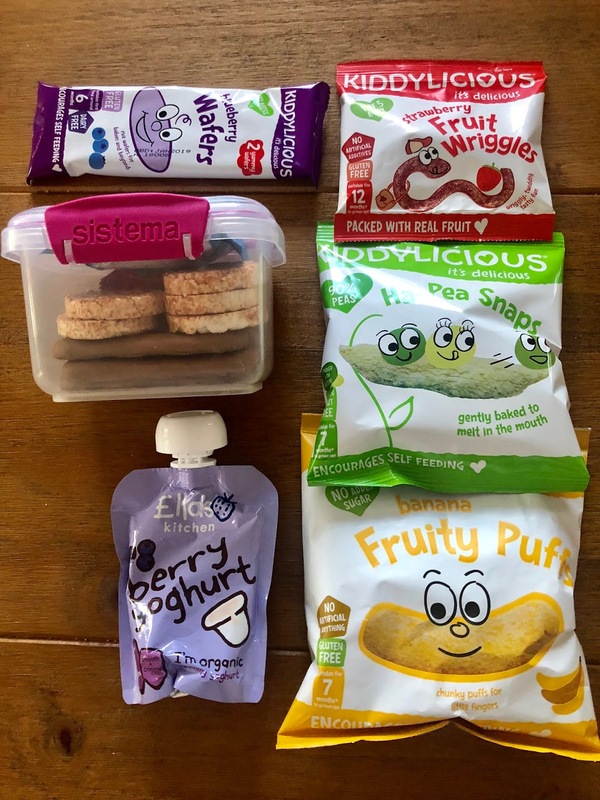 I’ve packed some of her favourite Kiddylicious snacks (we were chosen to be brand ambassadors for them last month which is very exciting!) and also an Ella’s Kitchen squeeze yoghurt because she doesn’t even use a spoon with these anymore she just holds them like a drink. I’ve also packed a small Tupperware box with some other snacks in, she has Heinz chocolate biscotti’s, Organix cherry rice cakes, an Ella’s Kitchen Oat bar and some Kiddylicious Coconut rolls. I love giving her options and it kills some time on the plane if we have more for her to choose from. We always pick up a pack of white chocolate buttons when we get to the airport and we call these the ‘Code Red’ for if she’s getting really agitated on the plane. We call them this because her ears prick up at the mention of chocolate or buttons ha! I then have her toys which are the main thing that keep her occupied whilst on the plane. I always buy a couple of new things such as the TY teddy because she’s obsessed with these so gets excited on the plane because she knows it’s new. We took these little animals last time and they worked a treat at keeping her entertained because she played with them on the plane table, so I bought a few new ones this time. She absolutely adores animals at the moment and knows lots of sounds so I know she’ll be loving these. 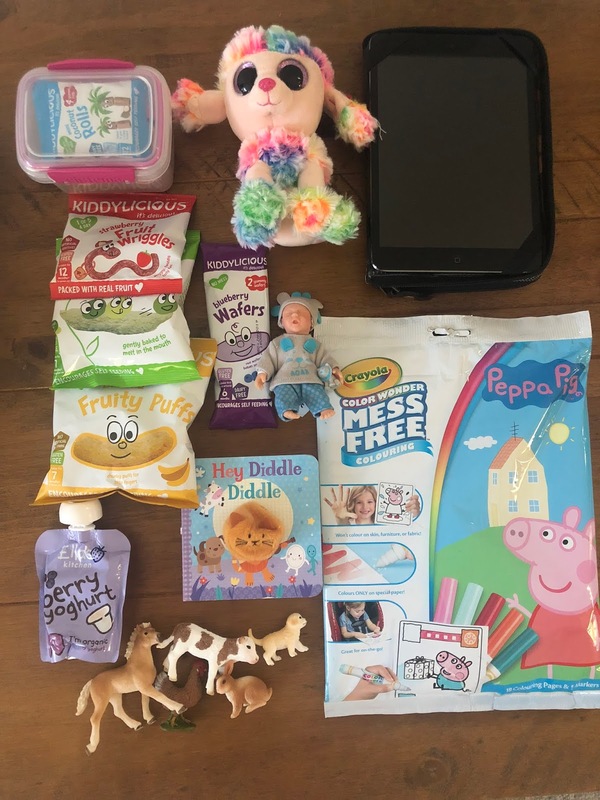 This time I also got her a Peppa Pig craft bag with no mess pens and some pictures to colour in. She loves using pens at the minute so I thought this would be something new and exciting to pass some time. She has this tiny doll (rather weird looking I know) but we got one last time for the plane and she loved it so I got another one because they are tiny so they don’t take up much space in her bag. Rosie absolutely loves books and the little puppet ones are perfect for travelling with. We picked up 'Hey Diddle Diddle' because we don't think she knows that one and she loves us singing new songs. Of course we have brought the iPad with us, we only actually get this out when we’re going abroad because she’s never usually too fussed with it but we’ve put some Mr Tumble on and Peppa Pig so it should come in handy at some point. Other things that will go in the bag that aren’t here are her water bottle, 2x dummies for if she falls asleep, and her favourite Jellycat bunny that she sleeps with. 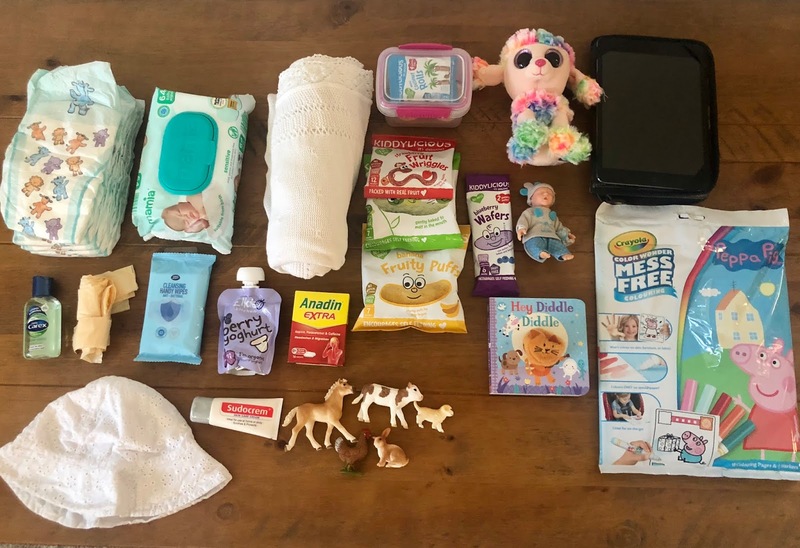 Hopefully this post was useful for anyone going abroad with little ones or anyone wondering what else they could do with packing for their toddler. oh my gosh, you are so organised! You’re well prepared for your trip. Kids need so much stuff for even a short flight. Lovely Post- this is so organised!! This is so cute and seems so efficient! I don't have a little one but I will definitely be telling my sister who does have a little one about those snacks! They look amazing for when travelling!